In the middle of my holiday I got a text with a message that really upset me. I responded in perfect NVC, with a lot of understanding and space for the other. I exploded. But because of this event, I did learn a few things about how to do NVC in the heat of the moment – when you are upset or angry. So last week I got a text message from someone, it was in my holiday, and it was a message that triggered me a lot. There was some agreement that we made and I was just super pissed. And even though I know NVC and all that, somehow I couldn’t stop myself and I just wrote something back.. and I knew it was demanding.. I tried to avoid judgements, but I knew there was some kind of jackal energy shining through. And I send it anyway. And of course, it didn’t bring connection, it just created more mess. And I wondered afterwards.. This is one of the things that still happens sometimes. This time I was really like, wait, I really want to analyse this: what happened? 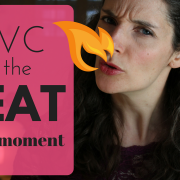 And I discovered a few things that I want to share with you, because actually this topic of doing NVC in the heat of the moment.. I hear it so many times. And when I was asking on my birthday, I said you can suggest a topic and I’ll pick someone.. And Will Dawn suggested this topic, and I was like, of course I have to do this, because it is so.. it goes for everyone I think, that it’s the hardest to do NVC when it’s heated, when you’re angry.. So, if you don’t want to ruin your connections in that one heated moment, that one day that you had your PMS – because I think this was the case with me as well.. Then, stay tuned, I’m going to explain to you what to do. So, first of all: don’t expect a miracle from yourself. When you expect from yourself that you, after one course in NVC, you will immediately be able to do it in the heat of the moment.. That’s like doing one course of Chinese and then being in front of this whole audience and talking about the solution for world hunger in Chinese. “..ehh, foe yong hai?” You know, something like that, it’s really like.. slow down, be a kind teacher to yourself. So, being kind to yourself, what does that actually mean? One thing you can do is to acknowledge progress. And the way I see it there is a phase before knowing in the moment what to do – it’s knowing afterwards what you could have done. Afterwards you might think “Oh yeah, I was blaming actually.” or “Oh, I was actually demanding, I should have made a request..” And this might come as self-judgement..
but you can also see it as actually progress: you know what to do. Okay, it’s a little late, but it’s a step forward. So next step is that you know it in the moment. So realise if you are already there, if you know afterwards what you could have done. And then, actually you can just go back to the person and say: “I know I was actually blaming in the moment, and what I would have liked to say is this and this.” It’s never too late to go back to the person and try again. If you know afterwards what you could have done, and that’s actually helpful, you can try it again and actually this time it is connecting. This means that in the moment, what happens when there’s a heated moment, is that we just don’t know what to do.. And because we don’t know, we go on automatic and we do the habit that we used to have: we defend ourselves and all that. And actually, it’s not only unpleasant to have this moment of not knowing what to do and therefore being frustrated.. It’s also kind of not done, in our culture, to just say in the middle of a conversation: “I don’t know, I don’t know what to do right now that would both serve my needs and yours.” That’s actually what’s happening. I’m just, in a moment, temporarily not knowing what to do. And because that’s actually the very thing that’s going on, the vulnerable thing that’s going on, that’s what I can share with the person.. That’s what could be connecting.. So I could just say “Right now I don’t know what to do that would serve both me and you.” That sounds kind of like a Marshall song.. *singing softly* Okay. So, this sentence is a very simple sentence. Make sure you remember it, maybe you want to adjust it in a way that fits you. It needs to be simple because in this heated moment there is not a lot of space in your head, right? Maybe the first time you forget about it. You might even hang it somewhere next to your computer. Just say that. And that’s it.